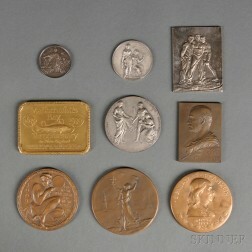 Save your search - find out immediately when "Charles Lindbergh" is available at auction! Lingbergh, Charles (1902-1974) Signed Photograph. 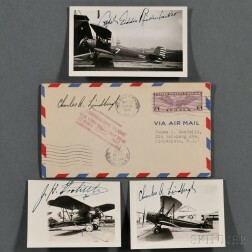 Lindbergh, Charles (1902-1974) Signed and Inscribed Photograph. Lindbergh, Charles (1902-1974) Document Signed 21 November 1931. 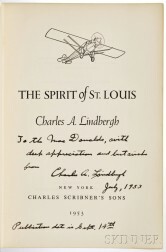 Lindbergh, Charles (1902-1974) Spirit of St. Louis, Signed Copy. Lindbergh, Charles (1902-1974) Typed Letter Signed, 9 November 1971. 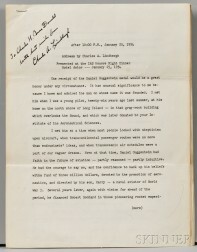 Lindbergh, Charles (1902-1974) Typed Speech Signed, 1954. 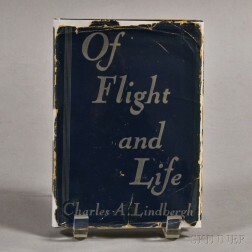 Lindbergh, Charles (1902-1974) Spirit of St. Louis, First Edition, Signed Copy. 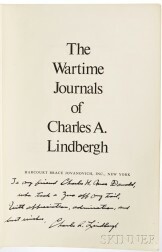 Lindbergh, Charles (1902-1974) Wartime Journals, Signed Copy.